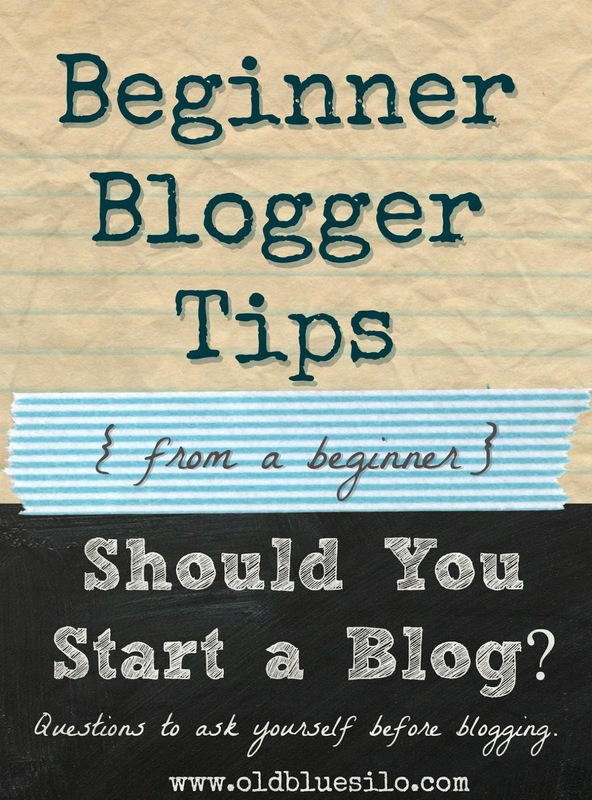 Last Friday, I started this new series on Beginner Blogger Tips. I've had some good feedback so far and I hope some of you get something out of it! Just to recap, I started this series, even though I'm a beginner blogger myself, because I find it a lot easier and more comfortable to approach and learn from someone on a smaller scale. When I first started blogging and had a simple question I couldn't find the answer to, I would email some of my favorite smaller bloggers who I knew had great potential. They always got back to me in a timely manner! I love Ree Drummond at the Pioneer Woman dearly and would love to ask her all my blogging questions but, quite frankly, and I could be wrong, but I doubt she would have time to get back with me. Today I am going to talk about some ideas on what to write about. That is the number one questions I get from friends and family. "How in the heck do you keep finding stuff to write about?" Obviously, in the blogging world, content is pretty darn important. A good blog needs to have good content! I am not guaranteeing that I have good content but I know it when I read it on someone else's blog. Keep in mind, these are just a few ideas and it's kind of what I stick to and what works for me, but there are definitely more types of post out there. The possibilities of blogging are endless. Get creative! I've always been connected to agriculture in one way shape or another. It's something I took for granted as a mid-west kid growing up in the country outside a rural town. My mom even remembers me dashing out to the pasture as a toddler in my underwear trying to feed the cows grass. I'd ride my bike up and down the road along the corn and soybean fields. Tractors and combines would go by as my brother and I were playing out in the yard as we'd wave frantically. We'd take our toy tractors out to the sandbox and pretend to farm. I'd always grab a hand full of corn and a few eggs from the barn to put in a toy wagon, even though they weren't to scale. I'm sure I am not the only kid that did that. 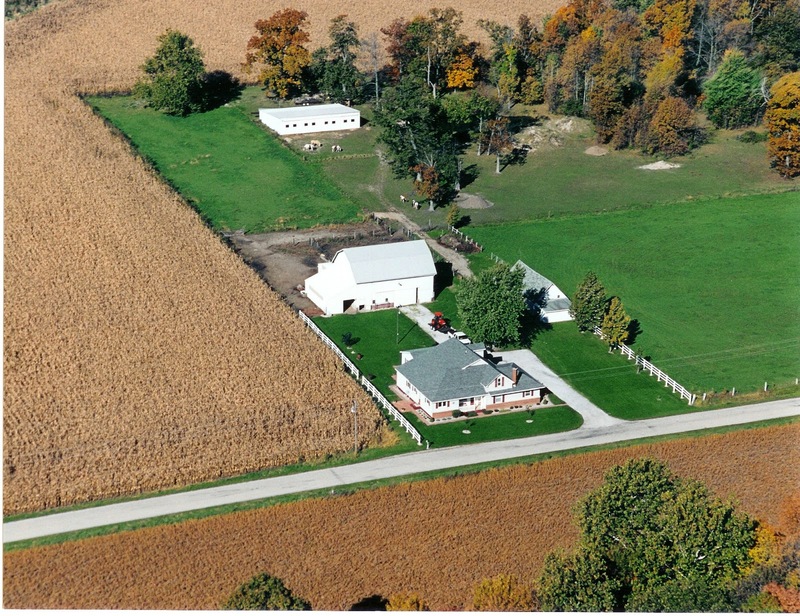 Growing up, my dad sold equipment at an ag dealership. I'd go in with him on Saturdays sometimes flipping through tractor brochures and chatting with old farmers as they came in to buy parts. I'd help my family bale hay in the summer. I remember food and a hot shower always being the best thing ever after stacking hay in the loft. It's a life I took for granted. It's a life that I had no clue would become my life as an adult. When I went off to college, I had every intention of becoming an interior designer and moving into a city somewhere. Once I was settled in at college, I found myself coming home every weekend. I found myself suffocated at school and I wanted to be with my friends and family back home. I didn't fit in with the girls in my interior design classes. I just went through the motions of school every week to get by. Early in college I was even dumped by a couple of boyfriends because they knew we would want different lifestyles down the road. They thought I needed to be with someone more like a farmer. I was confused but they knew me better than I knew myself at the time. 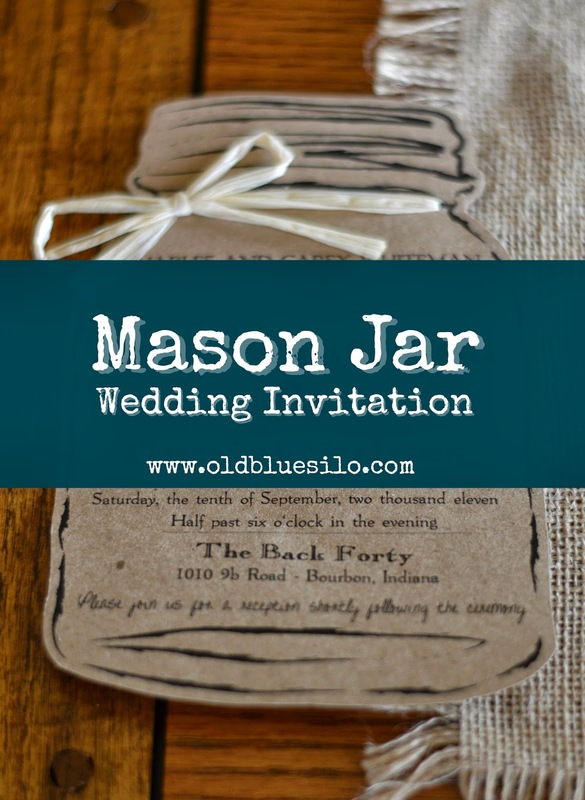 A few years back while planning my wedding, I never thought that I would somehow combine my love for mason jars into our wedding invitation. My thought process began with having mason jars on our invitations Then somehow, after staring at a jar on my dresser, I managed to take my ideas and turn the invitation into a jar.. Our wedding invitation is definitely my most favorite design project that I've ever done along with one of my most cherished items. Our invitations are more than just an invite with information for our guests. 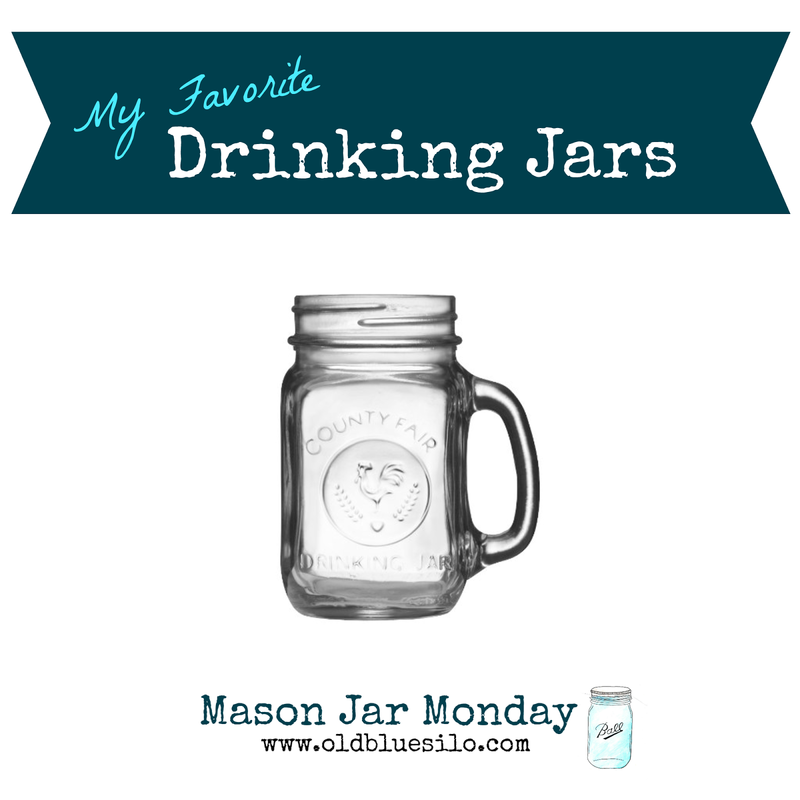 Mason jars are a true reflection of our lifestyle and heritage. I will never ever forget the moment when my mother in law found a bunch of antique jars in the root cellar that was once on our farm. My husband and I were only dating at the time, but she handed me the oldest and most valuable jar and said, "Here. Take it. I know you will cherish and appreciate it." I've never seen a jar like it before. It's my most favorite, traveling around the house in various spots until I find the "perfect spot." I am excited to announce my new ongoing series. I have had quite a few friends and even strangers approach me for advice about blogging. My first thought is, why is this person asking me of all bloggers. I am not big time. I'm just a beginner myself. I love to help people out, though despite my insecurity as a new blogger. I try to give them as much information as I can. Truth is, there is a lot to learn about blogging. There are wrong ways and there are right ways to blog, depending on the audience you're trying to engage. There are so many resources out there with language most of us have never heard of. 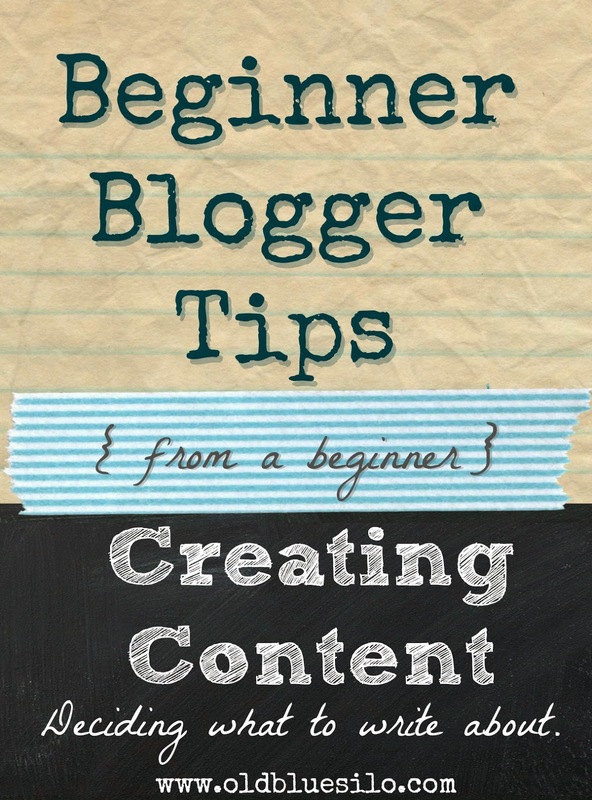 Some of the tips, lists and tricks provided by veteran bloggers can be quite intimidating. I am going to attempt to break down some tips and resources for those of you wanting to start a blog and even those of you who already have a blog but want to improve. Today, I am going to bring up some questions you should ask yourself before blogging or taking your current blog to the next level. Do you remember growing up as a kid and "running away" when you were mad at your parents? My running away usually consisted of hanging out in the hayloft or riding my bike down to the creek. I don't think my parents were ever too overly worried because the police where never called. They knew I'd get hungry and be back for dinner. I ran away last night. Yep, as a grown, adult married woman. My husband and I got in the the dumbest fight ever when he got home. I think it was about the fact he needed a hair cut mixed in with Netflix versus our cable subscription and what we were going to have for dinner. I really think it had nothing to do with any of those things. I think it was more me being mad at the world, trying to pick a fight. It's been a long cooped up winter. "I just need to get out of here!" "I don't know, but not here!" I jump in my vehicle and I pull out of the shop. He doesn't even come chasing after me. Now that I think about it, neither did my mom when I was a kid. I'm all about lemon right now. Can't get any springier than that. Is springier a word? It is now. I really, really want a Fit Bit. They track your activity and your sleep. Is it really necessary? Will I wear it a week and be over it? Testamonies welcome in comments! Loving how crisp and cool this shirt is. I felt it at the store. Over and over and over again. But the price tag kept us apart. Even with their %30 off sale. Everyone needs a little Gingham in their life. Especially navy gingham. Lets roll the sleeves up and enjoy some sunshine! Ok, maybe not right now. But hopefully soon. SOLD OUT. But I am still keeping my eye on this bracelet. Love all the different textures and the pop of sparkle. I am not much of a sparkle girl but I think every girl needs some once in a while. If you know me, you know why I need this. I don't own a boat, but I have taken a liking to boat shoes and their comfort. And the fact that they're leather. I love all things leather. Sorry, PETA. I'm a square toe kinda girl these days. 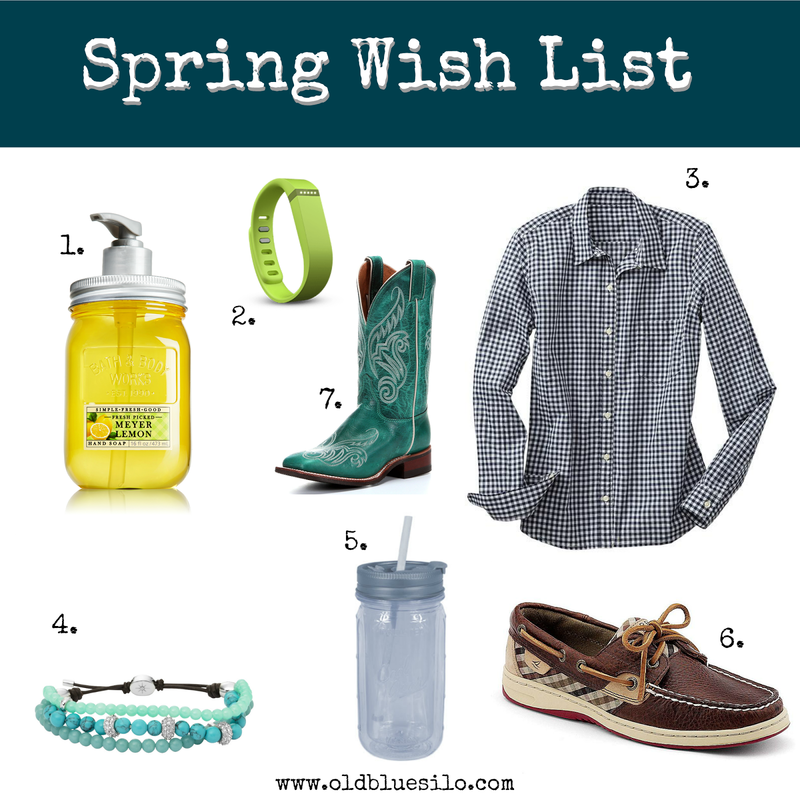 I don't really need a #turquoise boot. But I can still drool and think about it. This list is really just for my husband. Since I have a birthday coming in May. Just kidding. But no, seriously. Okay, just kidding. I've worn my snowboots and long johns more times than I can count this winter and I, yes, I, lover of winter am about over it. It's so brown and yucky out that I thought I might start thinking about spring. I'm a product person. I love trying out new things. Ok, maybe the same thing in a slightly different shade. I tend to be a creature of habbit that likes to try new things. Basically, I'm the biggest walking oxy moron there is. I tried to put together a fun, brightly colored array of things........ but I ended up back at my usual Earthy tones I tend to choose. Hey, thank goodness for the turquoise, though, eh? Boy and girl get serious. 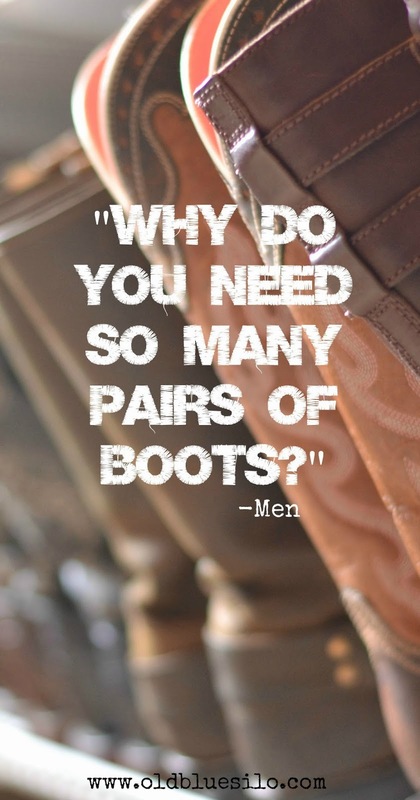 Boy asks girl, "Why do you need so many pairs of boots? Guys, if you haven't figured this out yet, #boots are just as important to some of us girls as shelter, food, water and clothing are to you. In fact, I think they should change the 4 means of survival to 5: shelter, food, water, clothes and boots. When I met my husband, he owned only two pairs of boots. One pair for work/farm/chores. And one pair for "good." Three years of us dating and two and a half years of marriage later, he's up to like 7. And, he couldn't be any happier! Or maybe his wife couldn't be happier because she's not having to clean up a pair before every outing. I did a Facebook poll with my lady readers/followers last night asking how many pairs of boots were owned by each. I was talking any type of boot. I had numbers everywhere from 0 to 28. I felt relieved finding a few ladies that own almost twice the amount I do. Phew! The average came to 8.5 pairs - I thought for sure it would be a lot higher but a lot of my farm girl and cowgirl friends who I personally KNOW have a ridiculous number of cowboy and muck boots didn't weigh in. So men, I'm going to answer your question on behalf of us gals with a lot of boots. Minimalists, I highly suggest you not read the rest. What I am about share about us gals with a boot fetish will make you cringe. I had the opportunity to attend the Indiana Livestock, Forage & Grain Forum down in Indianapolis, Indiana this week. I was absolutely beyond impressed with the information and issues that were discussed and presented. As young, small farmers diving into the world of agriculture and modern technology, sometimes it can be overwhelming sorting out the key issues and trends in which we should be concerned. 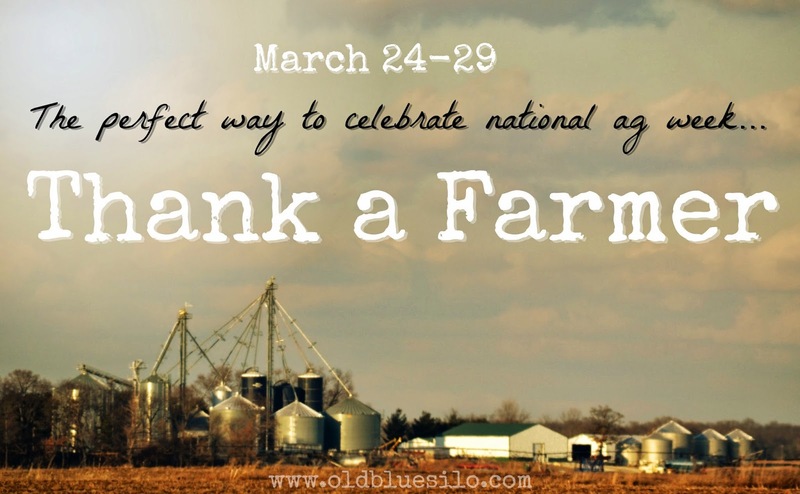 There's A LOT going on in the world of agriculture. Attending the forum has allowed me to sort out the issues and topics that I should be concerned with as an individual, consumer and farmer. The really neat thing about this forum is that it brings farmers of all types, agribusiness associates, ag economists, ag financial institutes, Purdue extension, FFA officers, Farm Bureau and many more together all in one room. We are all here for the same reason and that's agriculture and our concerns with how technology and big data will effect it. As consumers become more obsessed and concerned with what they're eating and where their food comes from, it becomes more important for us farmers and those of us in the ag industry to be as knowledgable as possible with our processes and data. 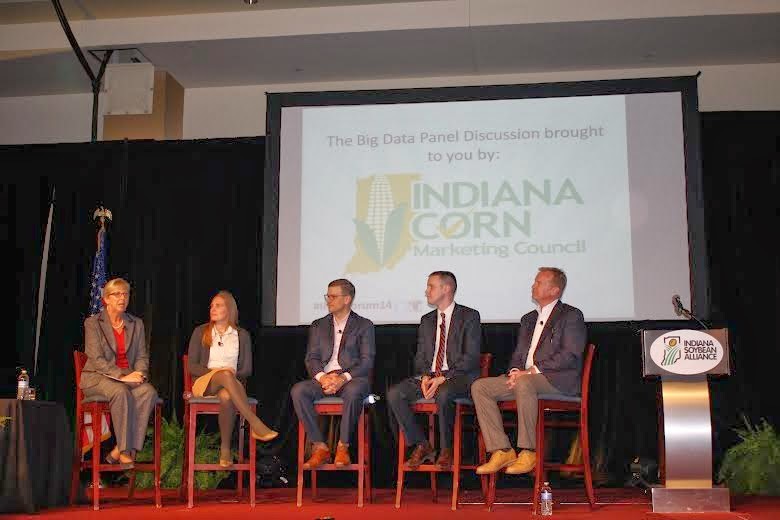 As Jane Stevens, CEO of Indiana Soybean Alliance mentioned while discussing trending issues, consumers are going to trust farmers before they will trust the food industry. This really has been a long winter for most of us that's for sure. Honestly, it's been a winter of nothing but complaining. Half the time, I don't think people even realize that they are complaining. I have written about the seasons on my blog in the past and how important they are in making things go round. A good read and my take on the importance of seasons can be found here, We spend our lives always waiting for that next season. As human beings, we thrive on the anticipation of something new and exciting. I've been thinking, though, as much as I love winter, maybe I will actually appreciate this summer. Maybe there will be a positive out of all this ice, blowing and snow we've had for the past 4 long months. This has obviously been mother nature's way of saying hey, y'all just need to slow down and take it easy. When you stop and think about all the crazy that's been going on in the world, it's hard not to appreciate the many hours we've been stuck at home with our families. I know we needed it. My husband and I have had a lot of time to dream together this winter. It has been a HUGE blessing. We've had a lot of time to chat about our goals and figure out where we want our lives to head. That's something we haven't had a chance to sit back and do since before our wedding and starting the process of house building. 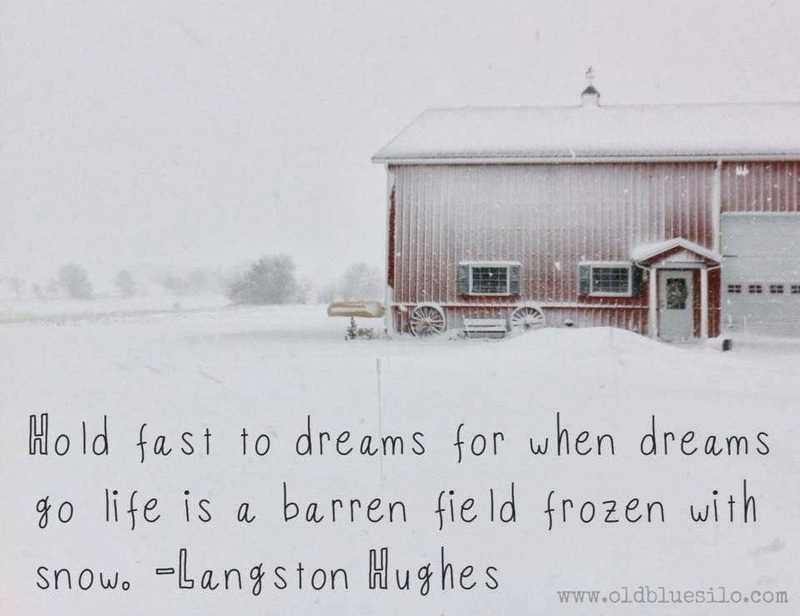 For a while, as we were just coasting on through current goals and dreams, future dreams really did feel like a barren field frozen with snow. This winter really has taught me how to dream again. Lately, we've all been dreaming about flowers and the birds chirping, obviously... but what I'm talking about is beyond just dreaming about the next season. I'm ready for the snow to melt, the sun to shine and dreams to start coming true. Have you ever suffered from insomnia before? I did quite a bit in college. It was not fun tossing and turning all night until about 3 or 4 am, then finally falling asleep until my alarm went off at 6. My "insomnia" sort of went away after college when I fell into more of a routine schedule and normal bed time. 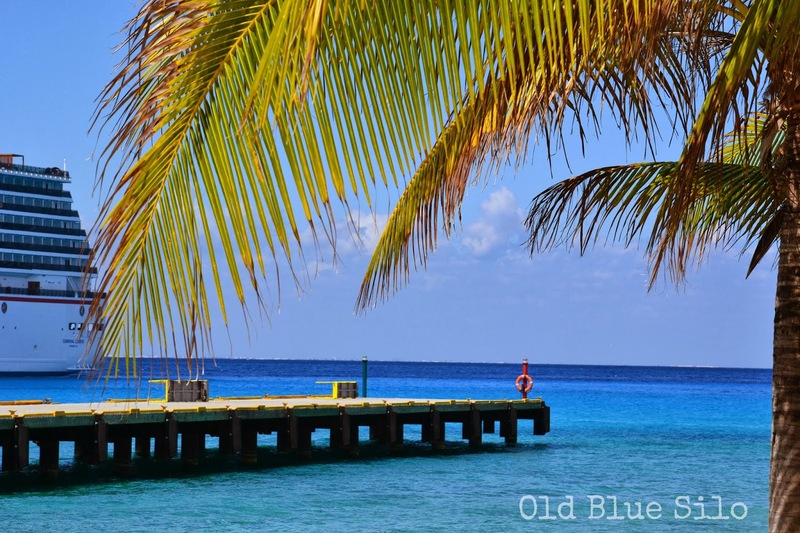 Last week, as I mentioned earlier, we were on our Western Caribbean cruise. As soon as my head hit the pillow, I fell asleep until the sun came up. It was absolutely amazing! I couldn't think of the last time I had a full night's rest of sleep. We thought maybe we slept so well from running around the boat all day. We also thought that maybe the slight rocking of the boat helped us sleep. We weren't quite sure what it was, but all we knew was how refreshing it was to have 5 nights in a row of good quality sleep! 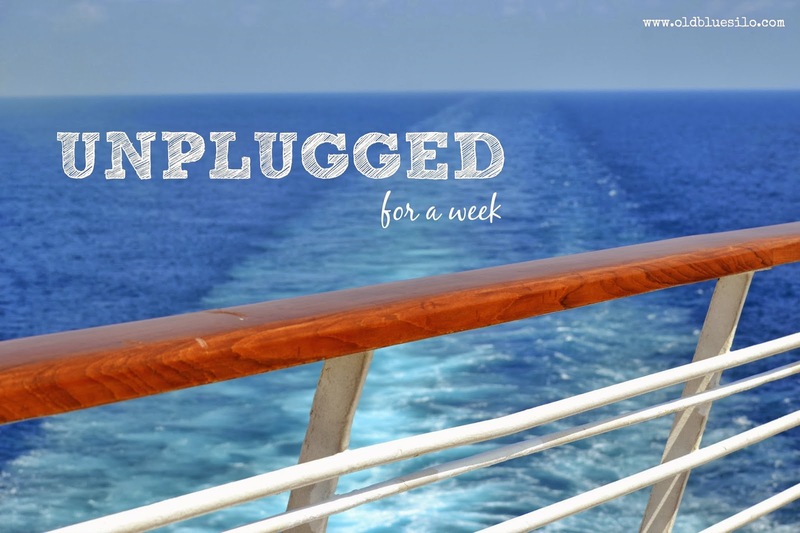 Once we got back from our trip, we realized that we were "unplugged" for almost a week. No phones, Internet or a lot of TV. I thought for sure the two of us would spend all weekend getting "caught up" on the week but really, once we were home, we were quite hesitant to get online or turn on the news. Instead, we talked a lot, did some grocery shopping, went out for dinner and rented a few movies. We had our first "unplugged" date back at home. It was really quite nice! A couple of weeks back, I ventured into Hallmark to pick up a few cards for some upcoming birthdays, etc. 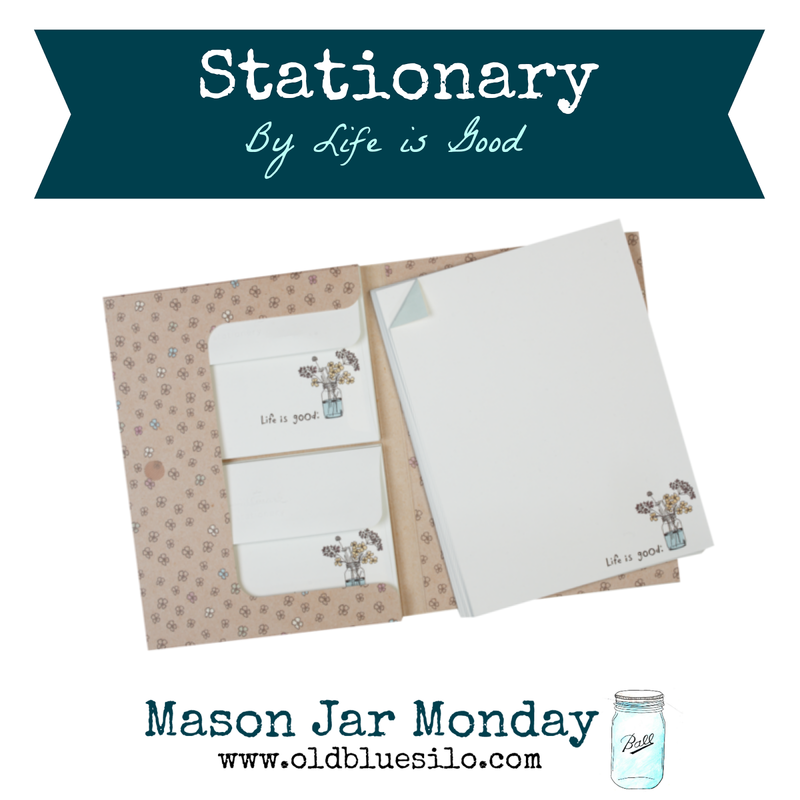 Not only did I find the cards I was looking for, but I came across a new line of cards and stationary that really reflects my style! I'm sure all of you have heard of the brand, Life is Good. Well, they have branched out from clothing and have come up with a few simple pieces of stationary that I could not pass up. Why do I like these pieces so much? Well, because of the delicate little mason jar full of flowers illustrated on front of the creamy rich paper, of course!